Two great titles will be released in early October as part of the Criterion Collection. 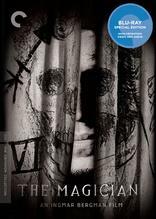 Criterion says Ingmar Bergman's 1958 drama 'The Magician' starring Max Von Sydow is slated for a Blu-ray on October 12. The Blu-ray release will feature 1080p video, an LPCM soundtrack, and supplements include: New visual essay by Bergman scholar Peter Cowie; Brief 1967 video interview with director Ingmar Bergman about the film; Rare English-language audio interview with Bergman, conducted by filmmakers Olivier Assayas and Stig Björkman; and a booklet featuring an essay by critic Geoff Andrew, a reprinted essay by Assayas, and an excerpt from Bergman's autobiography Images: My Life in Film. On the same day, Criterion will also release Wes Anderson's 2007 film 'The Darjeeling Limited' starring Owen Wilson, Adrien Brody, and Jason Schwartzman. Specs have yet been revealed, but supplements will include: Anderson's short film Hotel Chevalier (part one of The Darjeeling Limited), starring Natalie Portman, with commentary by Anderson; Audio commentary featuring Anderson and cowriters Jason Schwartzman and Roman Coppola; Behind-the-scenes documentary by Barry Braverman; Anderson and filmmaker James Ivory discussing the film's music; Anderson's American Express commercial; On-set footage shot by Coppola and actor Waris Ahluwalia; Audition footage, deleted and alternate scenes, and stills galleries; Original theatrical trailer; and a booklet featuring an essay by critic Richard Brody and original illustrations by Eric Anderson. You can find the latest specs for 'The Magician' and 'The Darjeeling Limited' linked from our Blu-ray Release Schedule, where it is indexed under October 12.